Over the past few years, I’ve done a few serious and many not so serious energy research projects. Thermal imaging is quite a powerful tool for doing serious energy research and I always wanted to try out to do this myself with a cheap IR thermometer. Recently, I got such a thermometer as a gift and I started to tinker immediately. I did not want to hack/destroy the brand new thermometer, as I still plan to use it in its original form later. For that reason, I decided to temporarily attach an old webcam to its back. This way, my laptop can read the temperature via the thermometer’s LCD display. In a second step, I connected two RC servos to an Arduino. 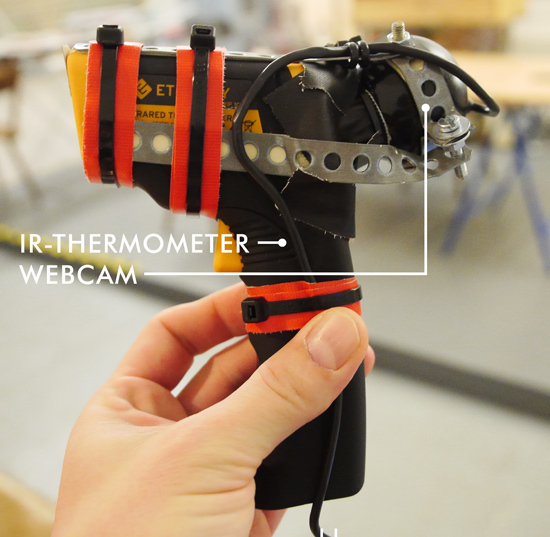 Those servos pan and tilt the thermometer – thus, the thermometer can scan an image. I also wrote a program in Processing, which sends the X and Y servo positions to the Arduino and at the same time reads the temperature via the webcam. 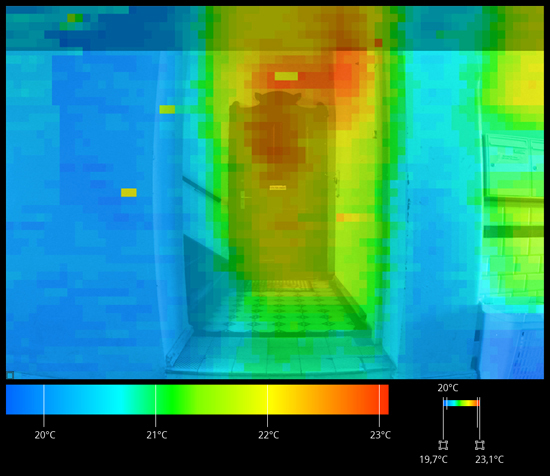 The program draws a thermal image based on the measured temperatures. This whole process is slow, mostly because the thermometer itself is slow, but of course the visual readout also takes its time. One complete scan in a resolution of 70*44 pixels takes about half an hour. When I’m writing this, it is January and it is cold outside. Perfect time for doing energy research with the help of my DIY thermal camera! I took a few pictures of my workshop from outside in order to see where heat leaks out. Below is a picture of the workshop’s front, facing towards the street. You can see a lot of heat coming out above the large window on the left side. The uninsulated box which contains the blinds is located there. The warmer spot on the right side of the door is also interesting: inside, behind the wall, is a heater. But I do not understand what the thermometer measures, when pointed on the glass of the window. Is it the temperature inside? Well, the measured temperature would be too cold. But it should also not be the temperature of the glass itself, as IR radiation should be able to pass the glass (you can feel the warmth of a sunray on your skin even through glass). I am confused. Feel free to get in touch, if you can explain what’s going on here. My backyard. Not a beauty from this angle. 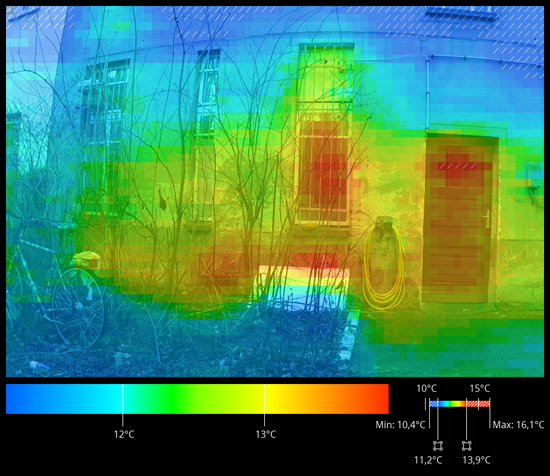 It’s also a challenging thermal image, as there are all those bushes in front of the windows. I cannot say if the thermometer measured the bushes’ temperatures or the warmth of the wall behind, or a mix of both. The only thing that becomes clear, is that a lot of heat is coming up from the cellar (the door at the right and the white sheet below the window). And finally the entrance door, seen from the staircase. 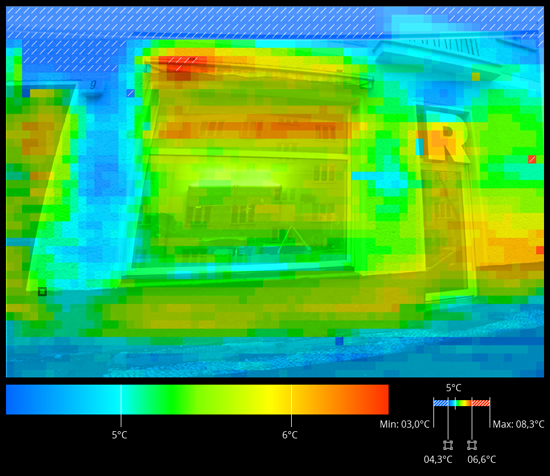 To be honest, I am wondering if I did a mistake when matching the thermal image with the reference image. Is the top of the door really so much warmer than its bottom? And the wall above the door: Is there so much heat stuck behind and escaping through the wall at this area? I should scan the door again and see how similar the second result looks. As you could see in the pictures above and in the video, I built the hardware for the camera really quick and dirty just with some foam board, adhesive tape, welding rod and a few zip ties. 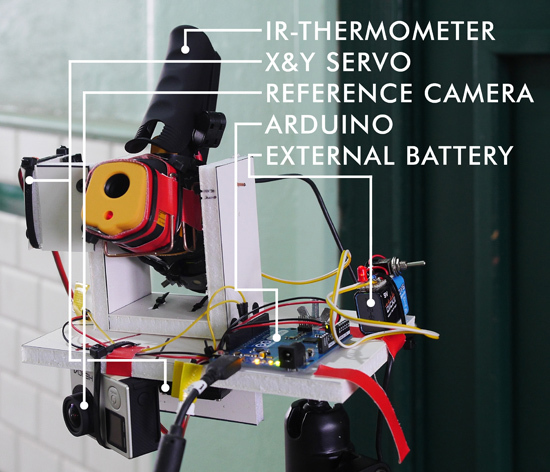 It only took me a few hours to complete and the rig should be fairly easy to replicate in case you want to build your own DIY thermal imaging camera.